Larrikin Gene (The Damaged Posse #2) by B.R. Snow is a tour-de-force expose of the criminal mind that reminded this reader of Jim Thompson Novels only better and way more fun to read. The author has a great style full of panache which splashes across every page in every colour imaginable. 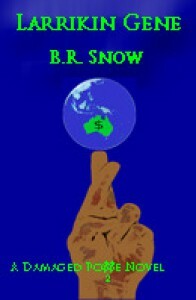 Snow paints flawed characters with such ease this reader immediately connected with them, good or bad, and rooted for them all the way. This is the mark of a master artist at work. The Posse - Doc, Merlin and Summerman become aware of a massive scam going down in Australia. And like all devious-minded individuals they decide to investigate for there's a good chance of enhancing their team. This is where Gene of the book title comes into play and what a play it is. This guy is every inch the James Garner Jim Rockford who knows it all and uses every trick in the book to his own advantage. Gene would sell Manhattan back to the First People if he could get away it and the author excels with this brilliant character revealing layer after layer of a complex person the reader will latch onto and not want to let go of.